In continuing with our 2013 trend report predictions, we have the bridesmaid. 2013 is going to be jam-packed with standout bridesmaid looks. They are going to be a tad fancier, a wee bit bolder and overall simply fabulous. We are confident that mix n' matching is still going to be quite popular along with allowing your bridesmaid to pick out her own gown. Pastels will still be big, like the sweet and romantic gowns above from Donna Morgan. Our prediction for 2013 bridesmaids is that they are going to be utterly fabulous. Flapper Style Dresses Great Gatsby will be coming out in theaters this Christmas, but we will see the roaring 20's fashions way before the film's release. Especially in weddings! We predict to see brides and bridesmaids in updated versions of the iconic flapper dresses like the little number above from French Connection. We look forward to seeing lots of tassels and flapper girl dresses this wedding season. We predict to see more formal looks this season on bridesmaids. Still super stylish, but a little bit more elegant. We plan on seeing lots of sequins and dresses adorned with embellishments. The bridesmaids above are a perfect example of the sparkly elegant numbers we plan on seeing. Beautifully captured by Jemma Keech. 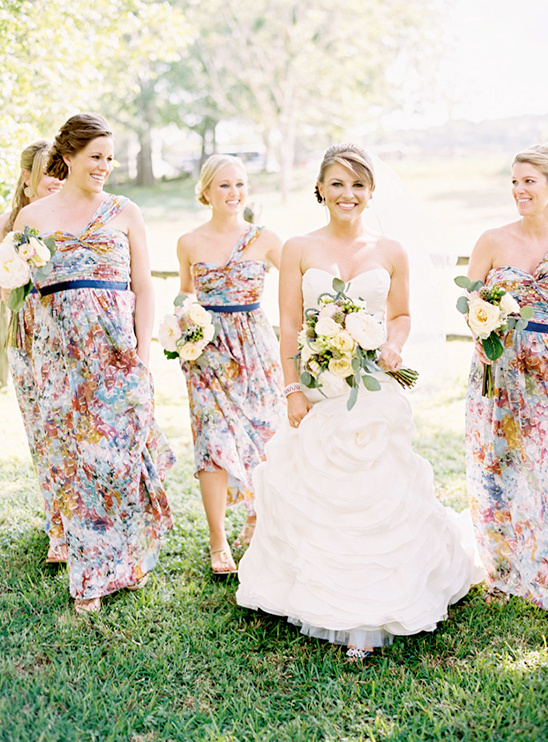 We predict that this wedding season we going to see a ton of bold patterns and pretty textures on all the bridesmaids . We cannot wait to see bridesmaids in bold and beautiful prints like the dresses above from Joesph and Chelsea's wedding photographed by Ryan Ray. Plan on seeing a lot of lace this season, in both wedding decor and the the main attraction. Lace will be spotted on the bride and the bridesmaids. A great example is the super cute crochet lace dress below from Dessy, which by the way comes in an array of colors that will match any palette. Brideside -the online boutique for beautiful and unique bridesmaid dresses -- has spotted "textures" as their favorite trend heading into 2013 wedding season. Jenny Yoo has created some beautiful looks for her new Social Collection, like this lacie number called the Hudson, that you could see below. Women should pair this dress with clunky jewelry to give it extra pop. You can also see more lacey numbers from Lauren Gabrielson, the talented designer from New York is exploring textures by layering lace over beautiful silks and mixing up the bodice from the skirt, be sure to go and check her designs out here. 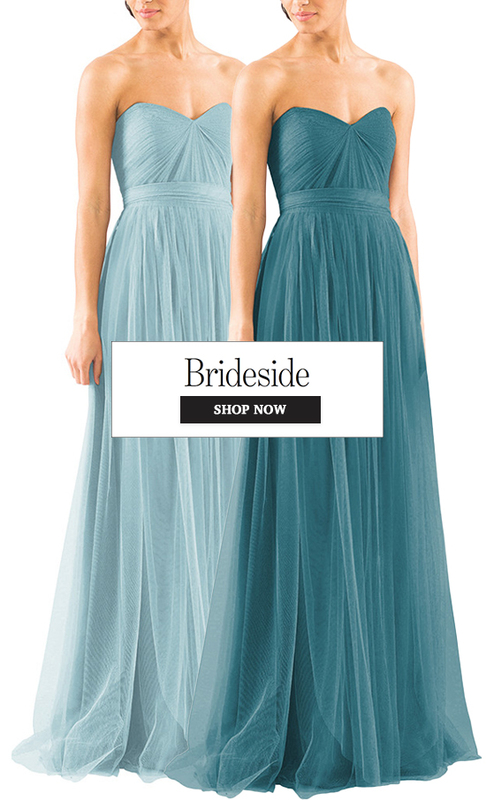 Brideside is the only online retailer to carry these looks so be sure to check out their collection. With all the main stream designers showcasing stripes this 2013 season, it will be incredibly easy to throw a few stripes on your bridesmaids. Thick or skinny, horizontal or vertical and of course the beloved chevron. Your bridesmaid would love this new take on the bridesmaid dress. Look for striped dresses featuring the 2013 Pantone color of the year, emerald green, and striped patterns made from material variations - think sparkles, sequins and ruffles of chiffon. Loving the dresses below, captured by Jacksonville wedding photographer Brooke Images. Since we already plan on seeing a lot of sparkles this season, it would be a shame not to throw gold in there, and as you know we fully support the gold movement. The metallic hue looks utterly fabulous on everyone. Well ... at least we think it does. There are so many shimmering gold dresses out there this season, we can already see your girls lined up sparkling in the sunshine. 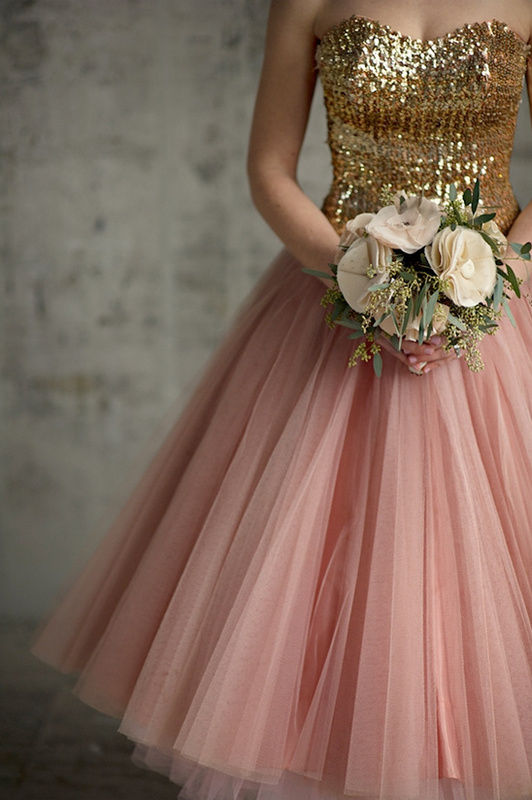 The amazing gold and peach tulle bridesmaid dress below is a stylish number put together by Event Jubilee.